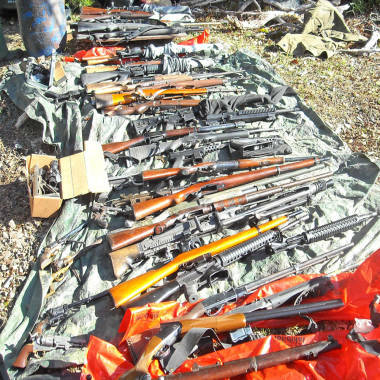 An arsenal of more than 100 firearms, cash and armor has been found in a cave in northern California. NBCNews.com's Dara Brown reports. Deputies in northern California have discovered a massive cache of drugs, cars, and weapons, including a belt-fed machine gun and more than 100 pounds of marijuana, the Humboldt County Sheriff’s department announced on Wednesday. A deputy uncovered the firearms on the 55-acre property of Ryan Floyd. They said 111 of them were stashed in a cave that had been camouflaged with rocks and brush; at least 20 of the weapons have been confirmed stolen, according to the sheriff’s office. Among the weapons, many of which were loaded, was a fully automatic, World War II-era MG 42 caliber machine gun, along with a full belt of ammunition. Also in the cave were several assault-style rifles including Colt AR-15s, as well as sawed-off shotguns and Tech Nine and SKS assault weapons. A number of the weapons are thought to be fully automatic, according to the sheriff’s office, and were fully loaded when found by a deputy. 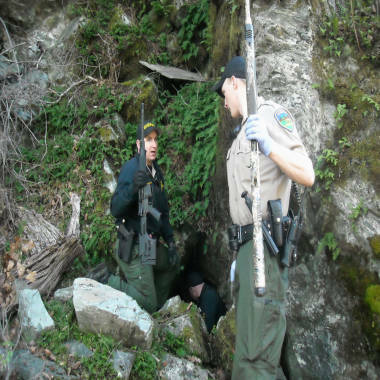 Sheriff's deputies recover weapons from a cave in northern California. Floyd is a longtime resident of the Humboldt County area, Knight said. The man may have amassed the weapons with plans of selling them on the black market, said Sheriff Michael Downey. “Based on what I saw, these were probably weapons obtained ... over the years either by theft or other means, and probably being sold on the black market somewhere along the way,” Downey said. Also on the property in Garberville, Calif., deputies said they found jewelry that an area resident had reported stolen, according to the sheriff’s office, as well as stolen construction equipment including a tractor, a concrete cutter, an air compressor, and numerous chainsaws. Many of the items discovered had been reported stolen in the area, the sheriff’s office said. A woman, Deanna McDonald, 33, and two small children were on the property at the time of the search, according to the sheriff’s office. Deputies issued McDonald, who is not supposed to own a gun, a notice for possession of a loaded weapon. In previous searches of the property over the past week, police made numerous other discoveries of contraband. Law enforcement first became interested in Floyd, 30, on Feb. 2, when a deputy tried to pull over a black Chevy pickup that was driving erratically. The truck, later found to have been reported stolen from a burglarized home, was discovered empty by police after plunging down a hillside and crashing into a tree. Deputies began to look for Floyd and Oregon resident Honey Walsh, 29, as persons of interest. Deputies and county Drug Task Force agents searched Floyd’s residence on Flint Rock Road in Garberville five days later, and arrested the man on an outstanding no-bail felony warrant for narcotics possession. He is being held without bail, Downey said. A preliminary probation search yielded 45 pounds of dried marijuana, more than $10,000 in cash, and heroin, along with scales and drug paraphernalia. Also found was a handgun, body armor, and numerous high-capacity magazines full of ammunition. Some of the weapons recovered in Garberville, Calif.
Police also reported finding evidence of numerous vehicles, including one that was confirmed stolen, according to a press release from the sheriff’s office. A second man, 48-year-old Gregory Benson, was also arrested on the property during the Feb. 7 search for illegal possession of ammunition and a firearm by a prohibited person. As police continued to scour the property, they found a stolen trailer, more bulletproof vests, methamphetamine, and more high-capacity magazines along with thousands of rounds of ammunition. They also found numerous empty gun holsters and rifle cases, leading them to suspect there might be more weapons on the property, and the discovery of the cave stash. Downey said he encountered Floyd’s father Wally, now deceased, multiple times on the sprawling property about a decade ago on drug and theft charges. “This is a piece of property I had been to numerous times surrounding the same type of criminal activity,” Downey said. A total of 117 pounds of marijuana have been seized on the property. The investigation is ongoing, and the California Highway Patrol is assisting the sheriff’s office in determining whether any of the other vehicles discovered on the property had been stolen. “There’s so much property out there, it’s hard trying to figure out what’s stolen and what’s not stolen,” Knight said.